The International Monetary Fund (IMF) is predicting that Grenada’s economy will continue to show strong growth for the years 2018 and 2019, but it will not be as strong as 2017 – the year in which the economy grew by 4.5%. “We estimate that strong growth will continue, but it will not be as strong as 2017, we think both in 2018, and 2019 real GDP growth will be 3.6%. We think that strong performance of the US economy will be a major contributor to that growth,” said Bogdan Lissovolik, who led the team from the IMF to conclude the Article IV Consultations that started on 2 May and concluded on 15 May with a news conference. Speaking on the economic outlook, he said, “Going forward beyond 2019, we expect that economic growth will ease towards a potential rate and that the long-term potential growth of the economy remains to be somewhat below 3% level.” He explained that the positive fiscal outlook would only be able to be maintained with continued compliance with the fiscal responsibility legislation which came into law in 2015 as part of the structural adjustment programme which concluded in 2016. “On the outlook for fiscal, we predict that there will be continued enforcement of the fiscal responsibility law, as a result of that observance the fiscal performance will remain very strong, and we expect primary surpluses in the next two or years to continue to be above 5% of GDP,” said Lissovolik. He said the team felt that the continued enforcement of the fiscal responsibility law will result in the rapid reduction of public debt by 2020. The team has estimated that Grenada is no longer one of the member states within the Eastern Caribbean Currency Union (ECCU) with above high average public debt, because it declined further in 2017 when compared to 2016. In 2016 it was 82% of GDP, and in 2017 it was 71%. 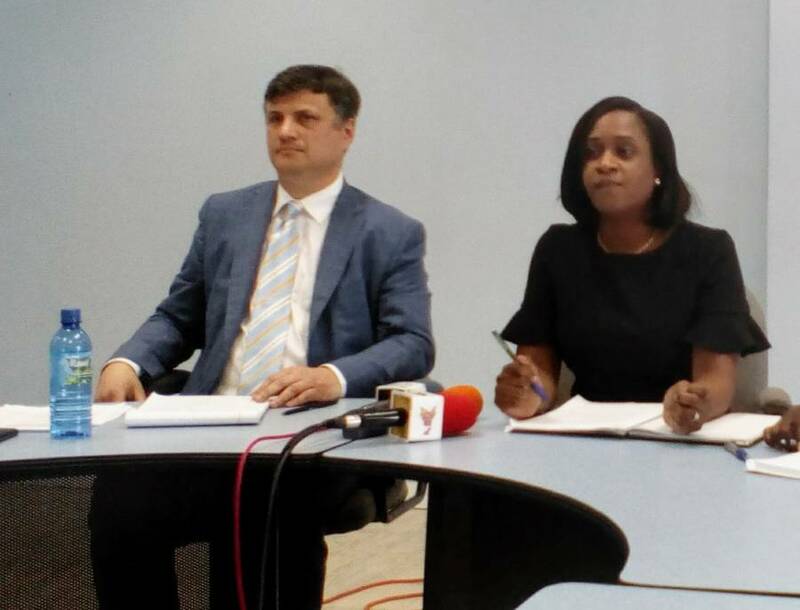 Describing the Article 4 consultation as a “health check” on Grenada, the team and government officials who met with the private sector, the labour movement and civil society representatives said that the Grenadian economy had done well for the year 2017. “As you know, there was a structural adjustment programme before, and in the aftermath of it, the economy in our view continues to be performing well and is on the right trajectory. Our goal here is not only to highlight the various success which has been many but to present an honest assessment of the risk profile of the economy and an assessment of what policy recommendations are needed to bring further progress and prosperity to the economy,” he told the media. Speaking on economic development, Lissovolik said that economic growth in Grenada has been strong. “Our assessment is that 2017 economic growth was 4.5% that is substantially above what we estimated before that is underpinned by good progress in the construction sector and tourism sector. On the other hand, the performance of the agriculture sector was a hard win because of weather-related negative effects but overall, GDP growth has been way above what we had predicted,” he said. Speaking about Inflation, he said, “Inflation, on the other hand, remains below 1%, the fiscal position is strong, the primary surplus we estimate in 2017 was 5.7% of GDP, that was a higher primary surplus than we were expecting,” he said.